Fulfillment. Management of multiple warehouse locations, zone skipping, courier label generation, real-time package life cycle management, seamless order uploading and filtering, customer-based preferences, access to 3-tier supply chain channels, client invoicing, robust reporting and analysis tools, and more. Ordering. Upload and process large batch orders or enter them from the admin (a useful feature for phone orders). On the front end, your website customers can easily enter multiple recipient orders, saving them valuable time compared to other systems. Routing. 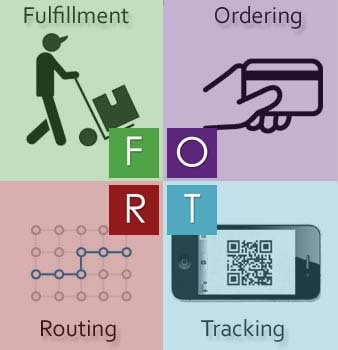 The FORT platform can route orders based on a number of different criteria, all based on your own business priorities. Proximity to recipient, product cost, product expiration windows, freight efficiencies/costs, delivery windows, etc., can all be utilized to route orders to the most appropriate and efficient fulfillment location. Tracking. Tracking is a general term used to represent the package life cycle, from label generation through to final delivery or return. Such functionality provides a real-time window into all packages, enabling both administrators and customers to see where any given package is at any given moment. This extends even to our 3-tier and zone-skipped packages, providing unparalleled visibility in the industry.